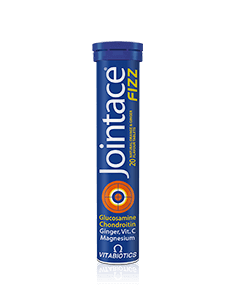 Jointace Collagen is available in the UK from Boots, Superdrug, Tesco, Waitrose, supermarkets and pharmacies, health stores including Holland and Barrett. Alternatively you can order online here. Glucosamine Sulphate (from Crustacean) (as Potassium Chloride) USP† , Maltodextrin, Hydrolysed Type II Collagen, Bulking Agent: Microcrystalline Cellulose, Chondroitin Sulphate Sodium (from Fish) USP† , Vitamin C (Ascorbic Acid [Carrier: Hydroxypropylmethylcellulose & Tartaric Acid]), Tablet Coating (Hydroxypropylmethylcellulose, Polydextrose, Talc, Maltodextrin, Medium Chain Triglycerides, Natural Source Colours [Titanium Dioxide, Iron Oxides]), Anti-Caking Agents: Silicon Dioxide, Stearic Acid & Magnesium Stearate, Vitamin E (D-Alpha Tocopheryl Acid Succinate)(from Soya), Vitamin B12 (Cyanocobalamin [Carriers: Trisodium Citrate, Citric Acid, Maltodextrin]), Zinc Sulphate, Manganese Sulphate, Vitamin D3 (Cholecalciferol [Carriers: Acacia, Sucrose, Corn Starch, Medium Chain Triglycerides Antioxidant: DL-Alpha Tocopherol]), Ginger Root Extract, Copper Sulphate, Folic Acid (as Pteroylmonoglutamic Acid), Sodium Selenate. †USP = United States Pharmacopeia Allergy Advice: For allergens, see ingredients in bold. 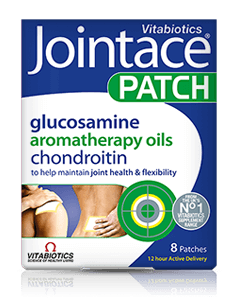 Jointace Collagen contains glucosamine sourced from natural chitin. Diabetics and those taking anti-coagulants (blood thinners) should consult their doctor before using this product. This formula replaces other Jointace supplements. A regular intake is recommended. 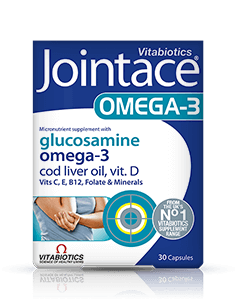 Jointace Collagen is recommended with a balanced diet, rich in fish oil. As with other food supplements, consult your doctor or pharmacist before using if you are under medical supervision, pregnant, breastfeeding, suffer from food allergies, or are allergic to any of the ingredients. Allergy Advice: For allergens, see ingredients in bold. Made in a site that may handle nuts. Food supplements must not replace a varied and balanced diet and a healthy lifestyle. 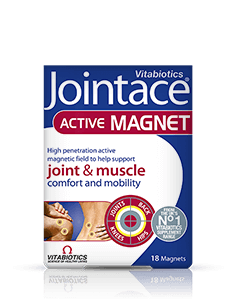 Why have Jointace Collagen tablets been developed? 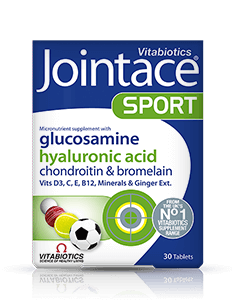 Can Jointace Collagen tablets be simultaneously used with medicines? 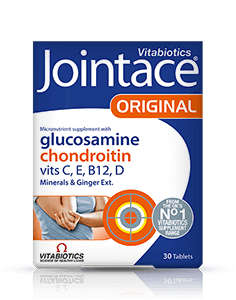 How many tablets does one pack of Jointace Collagen contain? 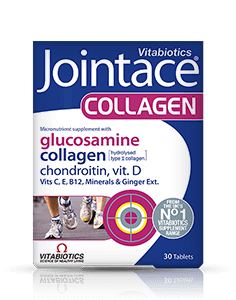 How and when should Jointace Collagen tablets be used? Are there any side effects whilst taking Jointace Collagen tablets? 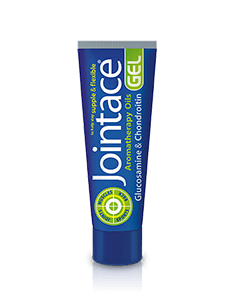 For how long should Jointace Collagen be used? 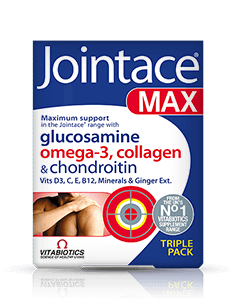 Are Jointace Collagen tablets recommended with any other Vitabiotics’ product(s)? Always read the product directions before use. Do not exceed the recommended intake. As with other food supplements seek professional advice before using if you are pregnant, breastfeeding or suffer from food allergies. 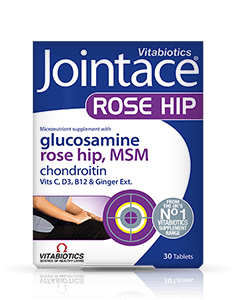 Jointace Collagen & MSM is a food supplement that contains glucosamine sourced from natural chitin. Do not take if you are allergic to fish or shellfish. Consult your doctor or pharmacist before using this product if you have an underlying medical condition (e.g. epilepsy, hyperthyroidism), or if on medication. Diabetics and those using blood thinning medication should consult their doctor before using this product. Vitamin supplements are not intended to treat or prevent any disease. Food supplements must not replace a balanced and varied diet, and a healthy lifestyle.